Notification Center is a great addition to OS X, but the alert sounds coming in with each banner notification from a million and one different Mac apps and updates can be pretty annoying fairly quickly, particularly if you have a lot going on. Rather than muting all system audio to hush the constant chiming, you can directly silence notifications on a per-app basis in OS X. This is done through the System Preferences. When you’re done close out of System Preferences. You shouldn’t need to relaunch any apps for the change to carry over to them, and the next notification/banner/alert from the apps you turned off “play sound” should arrive in silence. This better than disabling Notifications completely because you’ll still see them arrive as little banners, but the audio sound effect won’t trigger to bother you or your coworkers with beeps and boops anytime it’s your turn in Chess. Otherwise, the only other option is to temporarily turn off Notification center on the Mac for a temporary respite of activity and banner alerts, unless you want to go full force with disabling the feature in it’s entirety. 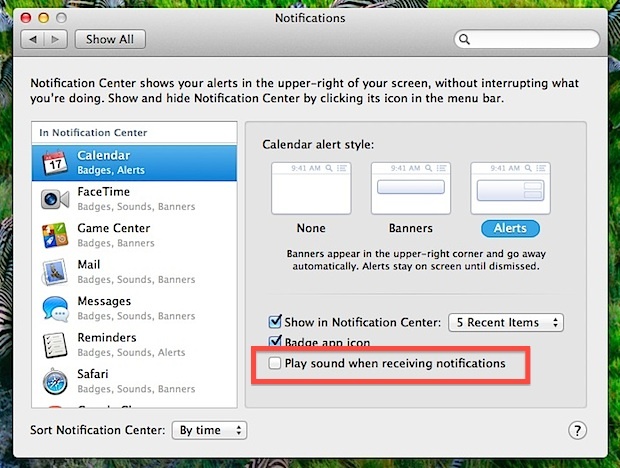 If anyone knows of a way to turn off alert audio for all notifications in OS X, let us know in the comments! Option+Click the icon and it disables notifications temporarily, do that when you want quiet. Do it again when you want alerts. Much easier than playing with settings amirite? When the Notification column is open scroll to the top and there is an ON and OFF button too. This is annoying me – I’ve turned off sounds for mail notifications in both Mail and Notifications and I still get a bloody deep beep every time I get an email! I can’t turn it off. Only happens on my new MacBook Air, not my iMac. I’m having the same problem now – have checked and unchecked the box in settings several times and am still getting a beep from Mail. I am having the same problem with both ipad and imac. Driving me nuts! I’ve tried setting the timer, turning off all the listed apps sound via notifications button, everything except turning off the speakers, which I want for music. Help!!! For those complaining about the alert noise (on El Capitan anyway), try going to System Preferences > Sound and turning the “Alert volume” right the way down. Thanks Ed- that worked, but kind of half-arsed way to handle this. Not sure why the traditional methods mentioned above did not work. can you solve that one? Yeah, how do we turn the AirDrop beep off? Do Not Disturb >> Doesn’t work, since it blocks AirDrop entirely from another device.